Ipomoea alba also known as moonflowers bloom in my garden in september. This time i bought the seeds and sowed myself. These are large seeds and i love sowing large ones as they germinate more readily and easily then the smaller ones. I planted them along with morning glory seeds. Although they have just started blooming but they are still not in full rhythm. When they come to their own, their speed of bloom opening is so fast you can make a video of around 40 seconds from start till end. Until october arrives, they do not open fully till dark. so i had to capture them in dark as well. now this is not easy lensing them after dusk but i did manage to get few pics worth posting. In above picture you can see buds of morning glory along with moon flowers. In morning i enjoy morning glory blooms and at dask, fragrance of moon flowers fill the air. although my datura wins the competition of fragrance but still moonflowers have their own subtle citrus fragrance. This last picture paid my efforts. this is one of macro shots and i had not thought a night macro shot would come so good. and this is not all, capturing a flower 15 feet high in the air while i was almost hanging in the air with trembling hands going for a macro shot, that was pure fun. I really enjoyed this pic. Absolutely lovely – they’re not of this world! The flower opening up is very impressive. I always find that timed exposures can put such magic on a blossom opening up. I can just imagine how you had to position yourself to take pictures. Next time, your wife should take photos of you taking photos of the flowers that are 15 feet away. Good for you! The low-risk factor is one of the things I love about digital photography. If it doesn’t work, the delete buttons is a breath away. And when it does work, ooh…we’re so proud of ourselves, as you should be. 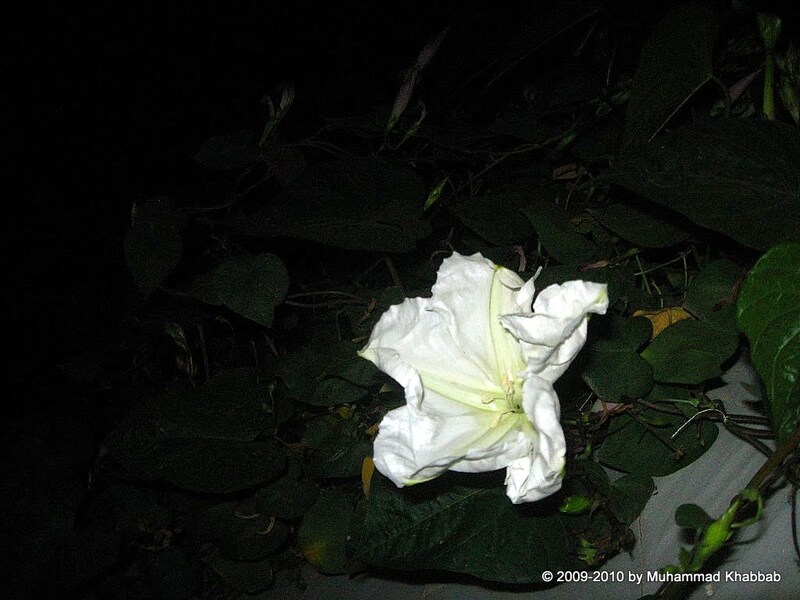 … Although the vine is leafy and tall, I can never get a moonflower out of it and have ceased trying. Some things just aren’t meant to be. Kudos to you! Lovely! I grew Moonflowers a few years ago and I felt so cheated when they weren’t fragrant. Will have to try them again. Beautiful and delicate. Its worth playing a macro shot. Hats off. 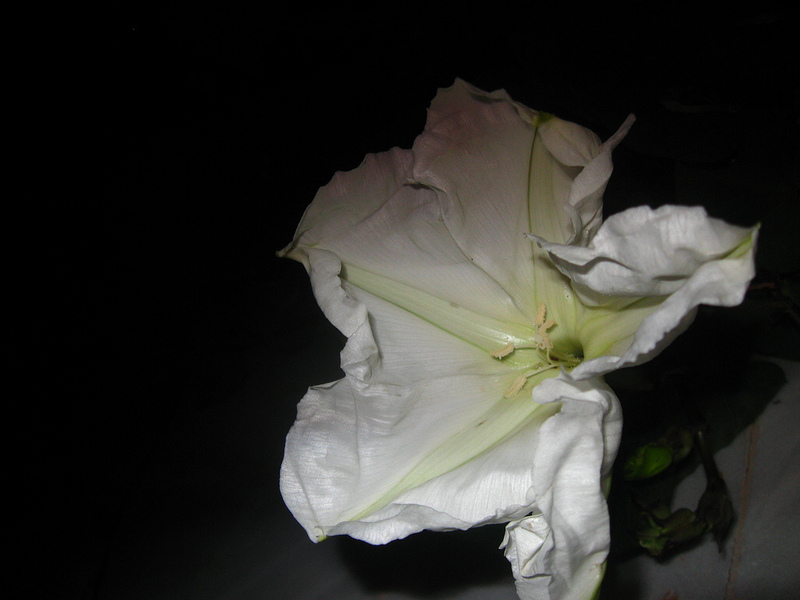 I really like the way your photographs show the gradual opening of the moonflower. Such an enormous, lovely bloom. Great shots! I wish I could smell the lovely fragrance too. Now I understand why they are called moonflowers. I notice that night blooming flowers are usually white and fragrant. I have never seen them before. 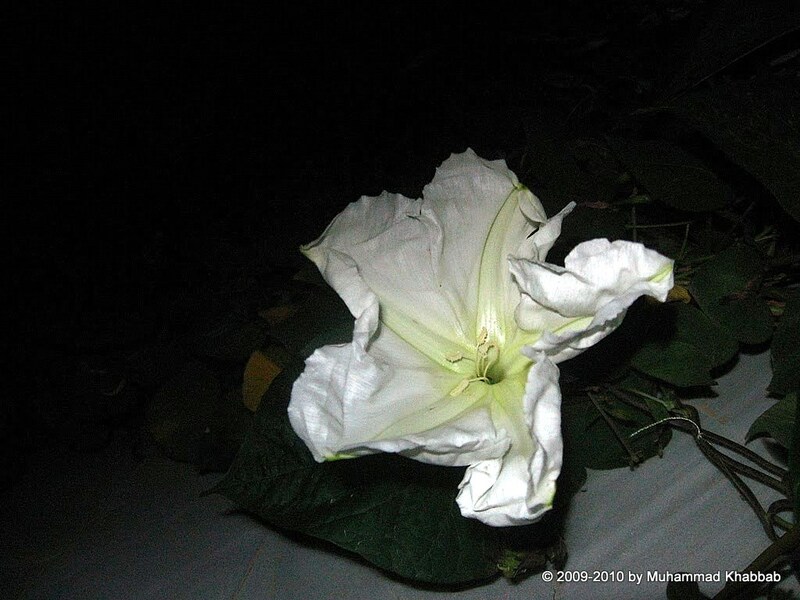 It is lovely to watch a moonflower unfurl… to their large full white moon self. I love the green star in the middle and the delicious fragrance drifting in the windows at night. I love your last image and can almost sense its final push to open fully. Do be careful on that ladder! Amazing you got such a good shot that way. It is sad that they do close up and die with the morning light… similar to a daylily but only reversed… just one night to live and make the most of it. I had but two blooms this year but they were delightful! These are so very, very beautiful. I’ve had no success with them in the past because I don’t think we have enough heat for long enough to get them to flowering before frost. But I love seeing what others can do with these lovely flowers. Well done! Lovely! Your Moonflower photos are gorgeous and read like a poem slowly opening piece by piece!I love moonflower too..wonderful! I have been browsing through many of your posts and they are terrific! I love the cosmos with butterfly too! wow!! keep sharing it is awesome! Lovely shot. I could almost picture you hanging in the air trying to get that perfect shot. I do it so many times…just to get that brilliant shot. What a fantastic flower. I haven’t seen these before. What are they native to? Just found you from the Cotswald Garden spot. Looking at your photos reminds me so much of my gardens in East Africa. It seems your climate must me quite similar as you have much the same plants in your garden. The scent of moonflowers really takes me back! Thank you for these lovely shots of the moonflower! They are just wonderful and the bloom petals are like silk. I’ve been having a heck of a time photographing my moonflowers as well! Good job. I wish I could capture one of the moths that frequent them but I’d probably be out there all night, LOL! Hi! I thought I’ll stop by and wish you a happy eid…! 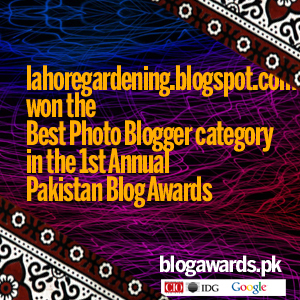 thanks every one for your kind comments. @Pickerel Weed – they are native to tropical America and other subtropical areas of world. @urban green – thanks so much for the Eid wish. i am delighted. Fab shot! The bloom almost looks like a double. I’ve always wanted to grow these, but have never done it yet. Next year, I will. I had no idea they opened that fast!